Interest in eggs reaches it’s height about now, especially for chocolate lovers and those who manufacture it, some people also like to send each other cards. The Tangram Egg Puzzle card has been around for a while now and a quick Google on the subject will bring up lots of images and instructions. The Tangram Egg can build anything that you can imagine with it’s nine pieces so cut along the lines to get those pieces and play with them until it’s built . 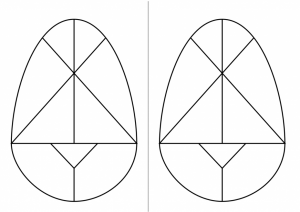 Colour and add some details then reassemble the pieces into the egg shape that is your Tangram Egg Puzzle.